If you have bleeding gums it is a sure sign that you need to have the health of your gums checked, and book in a professional treatment by our Dental Hygienist. In cases where the plaque and calculus build-up is low to mild, without any underlying bone or gum loss, a scaling and cleaning appointment will remove all the calculus (hardened plaque) build-up on the teeth and allow the gums a chance to heal. One to two visits are usually involved. Simple stains will also be removed. Your home gum health care program is also vital in the resolution of the gum inflammation. 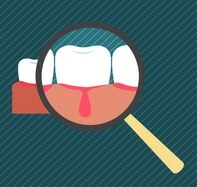 Our experienced hygienist will guide you through dental care techniques during your scaling and cleaning appointment. In cases where there already is measurable bone and gum health loss, our hygienist will recommend a series of visits to correct or reverse some of this early stage damage. Three to four visits are usually involved. Home care maintenance is vital. Laser treatment may be considered useful at this stage. To remove unsightly stains, plaque and calculus to give you a smile that sparkles once more. To ensure the long-term health of your gums, which will prevent further or more aggressive problems down the track. To control or prevent gum disease and possible tooth loss. To eliminate embarrassing problems that are usually associated with bleeding gums, such as halitosis (bad breath), as well as the bleeding gums themselves.